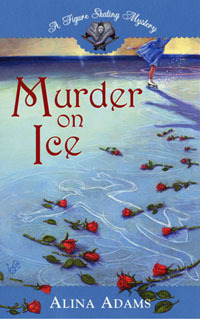 Figure Skating Mystery: THE FIX IS IN! As Skating With Celebrities settles into its regular time-slot tonight, Mondays at 8 on FOX (with no American Idol lead-in -- ouch! ), I have finally gotten around to watching the first episode. 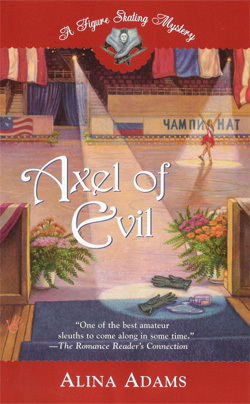 (What can I say, day job, a husband, two kids and promotion work for "Axel of Evil," puts TV watching pretty low on the agenda). 1) Early PR for the show suggested that, where the celebrities were concerned, this would be an even playing field. 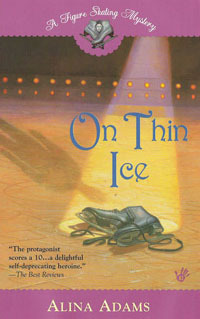 No one will have had any figure skating experience prior to strapping on their first pair of boots and blades. That obviously went out the window when hockey lover Dave Collier signed on. But now, we find out that Jillian Barbieri skated seriously until she was 15 years old??? The woman was doing Axels in the practice sessions! Not landing them, but taking off and rotating! Compare that to poor, old, no experience Bruce Jenner! 2) Which brings me to my favorite celebrity skater so far: Bruce Jenner. Yes, I know he was stiff. Yes, I know he didn't shake nearly as much cleavage as Kristy Swanson and Debbie -- sorry, Deborah -- Gibson. But this old guy with no prior skating experience did two waltz jumps in a row! Two! Walt jumps! And his backward cross-overs? They were actually good! Backward crossovers are hard! Especially when, unlike Kristy, Debbie and Jillian, you don't have a guy to pull you. Bruce actually looked like he was kinda, sorta leading. So rock on, Bruce! 3) As predicted, John Zimmerman is in the lead. (And I made my call even before I knew Jillian was a ringer). But what really puzzles me about Mark's participation in this show is that, in 2004, Mark Lund lost IFS in a hostile takeover. Which means that every time he is introduced on National Television to a viewing audience of millions as "the founder of "International Figure Skating Magazine," he is promoting the people who forced him out of business! The variation in skating ability before the show is one of the things that hit me as well. I think that the folks who weren't skaters are doing a phenomenal job. In particular the guys, who as you said don't have someone helping to hold them up. They also haven't traditionally been asked to be graceful and artistic. I love Bruce Jenner's comment tonight that he's never been judged on how graceful he is. They don't judge the shotput or pole vault on grace, just on distance or height. I definitely think Jillian should be out of there given her level of experience coming into this.